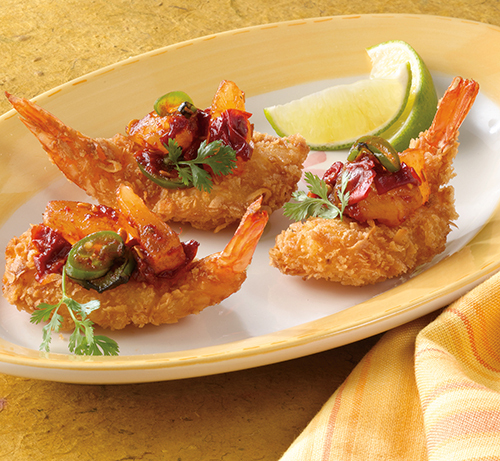 Flaky Coconut Shrimp topped with a sweet and spicy sun-dried pineapple and smokey jalapeño salsa. Preheat deep fryer to 350ºF. While the deep fryer is preheating, in a medium sauce pan add the pineapple juice, lime juice and brown sugar and slowly bring to a boil. Once the mixture has come to a boil, reduce to a simmer and add the chipotle in adobo and the candied pineapple. Allow the mixture to come to a simmer for 15 minutes. Slice the fresh jalapeño into wheels and add to the mixture and continue to cook for 3 minutes. Remove the mixture from the heat source and allow to come to room temperature. To prepare the King and Prince® Butterfly Coconut Shrimp, add them to the preheated deep fryer and cook for 3–3 1/2 minutes or until they reach a safe eating temperature of 165ºF and are golden brown. To serve, top each of the shrimp with a teaspoon of the sweet and smoky pineapple jalapeño salsa and garnish with a sprig of cilantro and lime wedge. 3 each Mrs Friday’s Coconut Butterfly Shrimp 16/20 ct. Recipe by King & Prince Seafood. Originally Published on their site.